In war-torn Syria, five out of six World Heritage sites now “exhibit significant damage” and some structures have even been “reduced to rubble”, according to new high-resolution satellite image analysis conducted by the nonprofit, nonpartisan American Association for the Advancement of Science (AAAS). The AAAS analysis, offering the first comprehensive look at the extent of the damage to Syria’s precious cultural heritage sights, was completed in partnership with the University of Pennsylvania Museum of Archaeology and Anthropology’s Penn Cultural Heritage Centre (PennCHC) and the Smithsonian Institution, and in cooperation with the Syrian heritage Task Force. The National Science Foundation funded the analysis, which provides authoritative confirmation of previous on-the-ground reports of damage to individual sites. 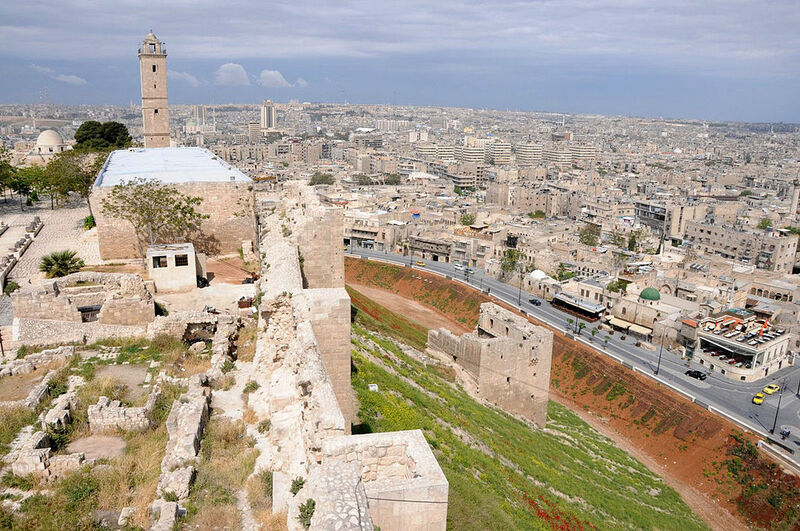 The AAAS analysis unveils extensive damage in Aleppo, one of the oldest continuously inhabited cities in the world, dating as far back as the 2nd millennium B.C. : “In satellite imagery, massive destruction is obvious throughout the city, and especially at the World Heritage site of the Ancient City,” Wolfinbarger said. Demolished structures include historic mosques and madrasas (Koranic schools), the Great Mosque of Aleppo, the Suq al-Madina, the Grand Serail of Aleppo, the Hammam Yalbougha an-Nasry, the Khusruwiye Mosque, the Carlton Citadel Hotel, and the Khan Qurt Bey caravanseraim as well as other historic buildings located both south and north of the citadel. Images taken in 2011 and 2014 exposed particularly severe damage to the Great Mosque, the nearby Suq al-Madina, and the surrounding area. AAAS and its partners documented roof damage and a destroyed minaret as well as two craters on the eastern wall of the mosque. While the most severe damage was seen just south of the citadel, destruction was also seen to the north‒ an area comprising of buildings from the late Mamluk to Ottoman periods (13th-19th centuries). Across Syria’s other World Heritage sites‒ the Ancient city of Bosra; the Ancient Site of Palmyra; the Ancient Villages of Northern Syria; and two castles, Crac des Chevaliers and Qal’at Salah El-Din‒ damage ranged from mortar impacts near an ancient roman theatre in Bosra, to military compounds in previously unspoiled archaeological sites, and new roads and earthen berms cut through the centre of the Northern Roman Necropolis in Palmyra. UNESCO has said that Palmyra, located in the desert northeast of Damascus, “contains the monumental ruins of a great city that was one of the most important cultural centers of the ancient world,” bringing together Graeco-Roman art with Persian influences. At the Crac des Chevaliers castle, one of the most famous examples of Crusader fortification architecture, images captured in 2010 and 2014 showed “moderate structural damage” including a 6-meter gash to its southeast tower and cratering of the grounds, AAAS discovered. In the Jebel Barisha Ancient Village Park, one of Northern Syria’s ancient villages, images taken before and after the inception of war revealed three new military compounds, two of which were within park boundaries. Continued AAAS research will examine further the damage to Syria’s World Heritage sites, as well as many other sites of cultural significance, Wolfinbarger said. In 2013, all six of the sites were placed on the “List of World Heritage in Danger,” maintained by UNESCO’s World Heritage Centre. The United Nations has made an estimate that the Syrian crisis has been responsible for 100,000 lives, as well as millions that have been displaced. As well as Wolfinbarger, Daniels, and Wegener, the research team included Richard M. Leventhal of the University of Pennsylvania; and Johnathan Drake, Eric Ashcroft, and Katharyn Hanson of AAAS. Images from the Worldview-1 and Worldview-2 satellites were provided by DigitalGlobe. The AAAS Geospatial Technologies and Human Rights Project, part of the association’s Scientific Responsibility, Human Rights and Law Program, had previously released reports on the conflict in Aleppo, which included an analysis of damage to the world heritage area there.